HELLO AUTUMN. Yesterday was the first day I experienced real, crisp, fall weather this year and I enjoyed every second of it. Fall has always been my favorite time of the year, not only because you can bust out your nicest fall coats and knits , light 100 candles and cuddle up with your favorite book + a nice cup of tea while the cold wind chases away the last leaves, but also because it’s the time of the year when I feel the most inspired. The midnight blue coat and the burgundy Kurt Geiger clutch are two new friends that I picked up in London last week and the cap is from a random sports store I walked by the other day. Can’t even remember the last time I wore a baseball cap, probably in middle school(?) but all of a sudden I feel like wearing them with everything, they add the perfect sporty touch to any outfit! If only I could find a nice, simple one in leather..
TOPSHOP coat. ZARA top. BIK BOK jeans. KURT GEIGER clutch. MICHAEL KORS watch. the hat and that coat are made for each other! I LOVE THIS! Your coat is PEFECT for Fall! I love this look! I saw this coat in Topshop, but it looks much better on you. Caroline, you are so pretty. Don’t really like how your ears come out :p, but the jacket is ooh so cool! Love it. Perfect jacket! How much did you pay for it? Thanks! I know what you mean about the baseball cap. Starting a couple of months ago I have been wearing them as well. I love the jacket with the leather sleeves. Love the mix of colours and textiles. You look great. inspiring. love the way how you made the look more playful by adding the hat! loving the baseball cap with the outfit…. Oh wow, this look is amazing! 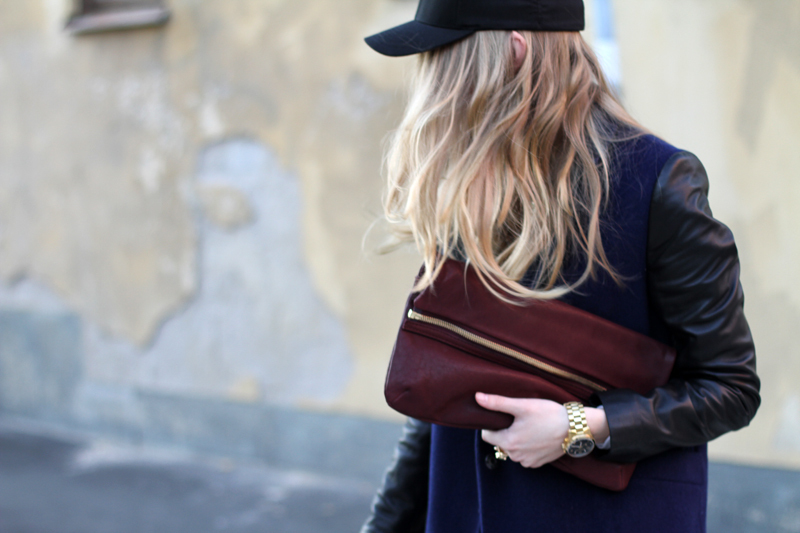 The navy, black and burgundy are just such a perfect combination. I love the baseball cap on you and mixing it with the leather sleeves of that Topshop jacket is genius! You’re right, it does add a great sporty touch. I might try it myself. I’ve been trying to find a way to do the sporty look for a while now. Fierce! love the baseball cap, it does add a nice twist to the whole look, instantly giving your look an effortless appeal. such kind of hat really suit you! I really like the coat !! So beautiful! 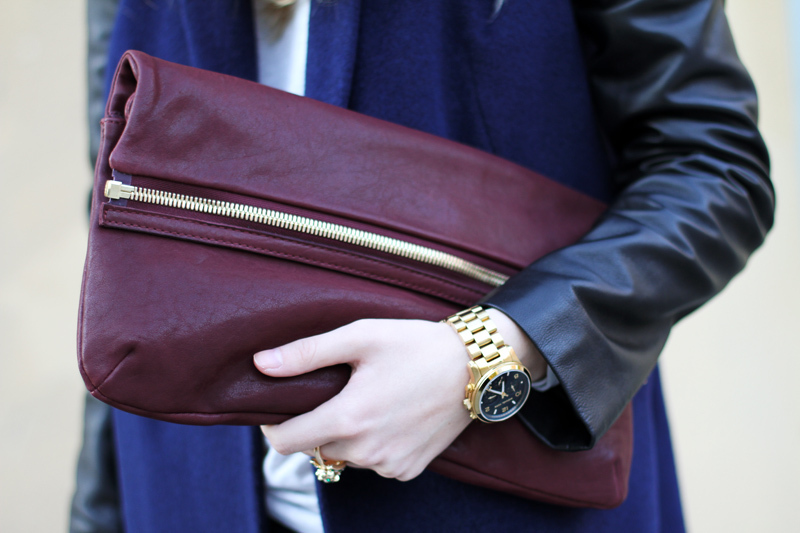 LOVE the burgundy clutch and that amazing jacket. Very Burberry with the hat, and the clutch… to die for! looking super good girl !!!!!!! love the hat. I don’t know why more women don’t wear hats. its a good look! This is such a darling look with a dash of athletic chic! The dual toned jacket is fabulous! Your new coat is a dream.This color is so beautiful,just like your clutch.This is the perfect look for fall. Great clutch the color is just perfect for fall!! I need to say that I don’t like the cap so much. Great outfit! Lovely how you combined sports hat in this outfit! Love the cap on you, it looks so good! Love this fall look. Great coat. Love the colour of your clutch. I can’t remember the last time I wore a baseball cap. Nice touch. I’ve never seen a baseball cap look so classy! I can’t wait for the brisk of autumn to hit here. Autumn holds my most fondest of memories. Gorgeous! Love the how slick and sleek everyone looks. What about this Miu Miu cap? I think it would look gorgeous on you! Super look! I like every pieace in this outfit! Cool! The outfit with a sporty touch. One of the trend we can see in every outfit of everyone in coming year…You began yet…Great!! adore the slight sporty touch! Gorgeous look & you rock the baseball cap! Love your Kurt Geiger clutch, such a gorgeous colour!! damn, girl! the cap is a very good choice! I found out that fall is one of my favorite season so far. September especially! Same for me ! Love the coat and clutch ! OMG you look perfect. i like so muhc that red clutch. LOVE the cap! Ha ha I used to wear those to (in middle school lol)! I think it’s a briliant touch to the outfit and it gives the whole look a fresh take, nicely done! great colour combination! Absolutely love the hat! You are the only person who can make that cap look amazing! I love it! Very pretty! Love the cap! I am becoming obsessed with Kurt Geiger, thanks to you! Love the way u write and ur blog is just amazing! Really amazing!! I like the look very much! Welcome autumn! Nice look! I like the colors combination! I wish it was cold in Brazil, I love this coat! Absolutely in love with your burgundy clutch! Favorite color of the season. WOWW amaaaazing outfit!! one of my favorite ones so far! You can pull of that cap so well. I love the choice of colors. I how professional your pictures look! I relly like the clutch! I love these pics – check out my first fall images and let me know what you think? LOVE the contrast Zara Coat. Oh the clutch, gotta love it! I love how your combining sporty with chic – looks amazing! Great outfit! I absolutely love the ball cap! So not like you but I love the look! love this look! I agree.. fall is the weather I love the most cuz I love the possibility of layering and it gives me a ton of inspirations! Vart har du fått tag på kepsen? I love how you paired a plain baseball cap with this and you take a normally dorky piece to a completely chic level! Hi, your images are always so beautiful. I was wondering what camera and lens are you using? Would be nice if you could mail me the answer! Thanks. I absolutely love this coat. I am so craving a mixed material coat this winter. The combination of the cap and the coat is perfect! I love your make-up in this post. OH MY GOD this is the best coat EVER! !the outfit is perfect!